Behind his parents’ candy shop, Alan Chang sat in the living room of his two-bedroom apartment in Queens, New York, meticulously cutting along the dotted line on the back of a milk carton. This was a few decades ago when dairy companies, such as local milk purveyor Dellwood Dairy, would offer discount coupons for tickets to MLB baseball games on milk cartons. Growing up in a lower middle-class family with his parents and two siblings, Chang hoped these coupons could help him go from cheering on his heroes at home to seeing them live in The House that Ruth Built. “I remember asking my parents if we could go to Yankees game, and we just could not afford to go,” Chang recalls. Over the next few years, Chang and his family moved to various locations around the New York borough, including Woodhaven and Jamaica. Despite growing up in Queens—the home turf of the New York Mets fan base—Chang’s admiration for those in pinstripes only grew. In the mid-1970s, the New York Yankees were an average baseball club, winning only about half of their games every season from 1971 to 1975. But by 1976, a dynasty was brewing in the Bronx. The Yankees would go on to win back-to-back World Series in 1977 and 1978. As a child, Chang had no idea that, years later, he would commute daily to the stadium he once couldn’t afford to visit. But before he earned the title of deputy general counsel and vice president of legal affairs for the New York Yankees, he had to earn his place in the legal field. His parents encouraged him to pursue an educational path that would lead to a practical career. Despite starting in premed, Chang transitioned to political science courses and then worked as a corporate paralegal his junior and senior year. That’s when he decided to pursue the “practical” path to law. After law school, Chang headed to Los Angeles to begin practicing law as a commercial litigator. Eventually, he saw a job posting for an in-house counsel position at ESPN—a perfect move into the realm of sports that he loved. What ESPN would soon learn is that Chang was just as tenacious and competitive as the athletes whom the network covered. Those words resonated with ESPN. After months of meetings, phone calls, and trips to the company’s headquarters in Connecticut, Chang secured the role he had aggressively pursued. Chang says that he thoroughly enjoyed his tenure at the company—so much so, in fact, that there was only one job Chang envisioned that would draw him away from ESPN. That job was, of course, working for the organization he had cheered on his entire life. As fate would have it, that opening presented itself in August 2000. After meeting with the chief operating officer and general counsel of the New York Yankees, Chang accepted the role as counsel—just two months before the Yankees would win their twenty-sixth World Series in team history. For a kid who didn’t see his favorite team in person until he was in law school, Chang was astonished to find himself at Yankee Stadium on a regular basis, walking the same halls as his boyhood heroes. Those results run the gamut in areas of the Yankees’ operations, as Chang spends his time on multiple areas of focus. 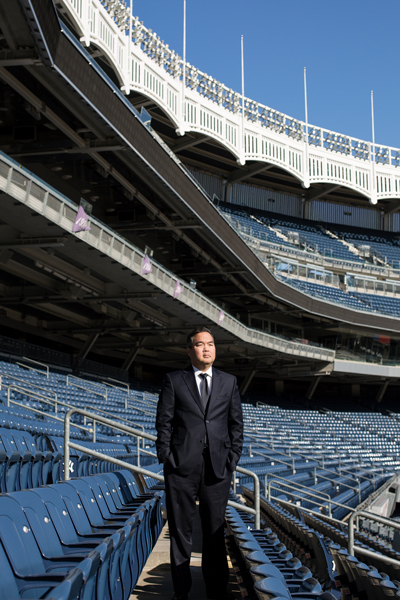 From his office, which is adorned with team memorabilia and seats from the previous Yankee Stadium, Chang sees different issues come across his desk every day. He refers to himself as a legal counsel generalist, as he helps address any issues that may arise with employment, various statutes, or any litigation matters. The Yankees are a baseball team, but they’re also a $3.75 billion business, and so they face all the issues that any corporation of its size would face. As Chang explains, being a specialist in a particular discipline—such as antitrust, intellectual property, or litigation—would be too narrowly focused to serve the organization well. “In order to best serve the Yankees, it is necessary to have knowledge and experience in different legal disciplines so that you can provide sound legal advice across all the functional departments within the Yankees’ organization,” he says, adding this includes stadium operations, human resources, sponsorships, and more. Because of his background as a commercial litigator, Chang understands procedures well and provides oversight on several matters. He works closely with Doug Behar, senior vice president of stadium operations, for example, assisting with vendor and union contracts. Also, because Yankee Stadium hosts multiple events outside of baseball—concerts, soccer games, and NCAA College Football’s Pinstripe Bowl—Chang works to ensure that all of the moving parts are in proper legal order. Balancing that diverse work has gained Chang the admiration of his peers, who recognize his dedication to both the team and the organization. Chang enjoys the wide spectrum of work. Not only does it keep his day interesting, but it also correlates with the culture of the organization and the importance of doing things the “Yankee way.” It’s a mantra that rings throughout the organization: Just as the Yankees want to win championships on the field, every member of the organization sets out to give fans the best experience possible when they come through the stadium gates. It may have taken Chang longer than he would’ve liked to enjoy that fan experience firsthand at Yankee Stadium, but having advanced to become the deputy general counsel, he has come a long way since cutting out coupons in his living room. A few years ago, Chang had the opportunity to bring his fan experience full circle, when he brought his father to the owner’s box for a game. As his dad enjoyed his first in-person Yankees experience, Chang reflected on how his upbringing and the years of tireless work culminated into something far greater than a profession. Every once in a while, as he’s walking the halls of Yankee Stadium, Alan Chang pictures himself back in Queens, New York, seeking milk cartons for MLB baseball ticket coupons so that he could see his childhood favorites in person. Nowadays, Chang is not only seeing his favorite baseball team firsthand through his work with the organization, but his work as deputy general counsel is also helping the entire organization thrive, whether that’s from an organizational standpoint or being behind the scenes in giving fans an outstanding experience. As a result, it’s not uncommon for Chang to speak about the importance of combining profession with passion. There was only one job that could draw him away from ESPN, and that was his dream job: working with the New York Yankees organization. Alan Chang, deputy general counsel and vice president of legal affairs for the New York Yankees, is New York City through and through. A lifelong Yankees fan, Alan advises on all aspects of the Yankees’ baseball and stadium operations. KM&M is proud of Alan’s accomplishments and our seventeen years working together for this special client. Boies Schiller Flexner is a firm of internationally recognized trial lawyers, crisis managers, and strategic advisors known for creative, aggressive, and efficient pursuit of success for clients. Over two decades, BSF has established a record of taking on and winning complex, groundbreaking, and cross-border matters in a broad range of industries for many of the world’s most sophisticated companies. The firm builds deep relationships with its core clients so it can represent them in any matter anywhere in the world. BSF brings the same skill to its pro bono and public-impact litigation as it does in its commercial work.